I have given myself over to the dark side of mango consumption. I am going for broke with the luscious orange fruits this year, perhaps eating them with such wild abandon in observance with India's mango crazed month of May? It's good enough reason for me. I mean really, I'm obsessed. The little Filipino variety has been my favorite available to me in Portland, thus far. I'd really love to taste all the mangoes of the world. Now there's a book I'd love to research! Apart from eating one by itself any time of day or included in an afternoon tea snack, my new thing is to put juicy chunks on my oatmeal -- really a lovely pairing when you think about it, nutty oats with the bright tang of mango brightness, doused in a heavy hand of shredded coconut, this is a super pairing that will fill you up while taking your tummy to the tropics! Do try it. Mmmmm, great idea for a healthy breakfast! 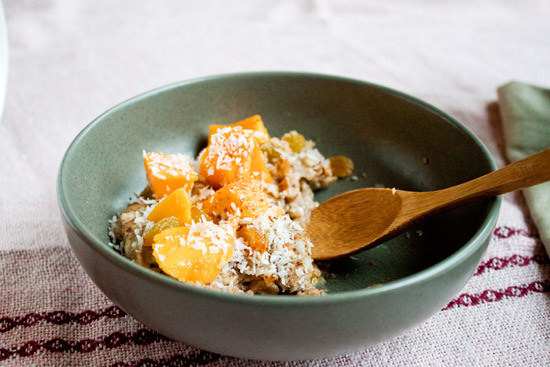 I love mango, but I never think to put it in my oatmeal - brilliant!